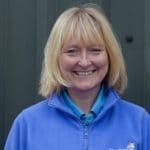 Heather is a Community Paediatric Physiotherapist for NHS Lothian based in East Lothian and has been volunteering as our lead physiotherapist since 2005. Heather piloted a successful riding therapy service between NHS Lothian and Muirfield Riding Therapy in 2009. This pioneering partnership became the Therapeutic Riding Service, part of NHS Lothian’s Children’s Physiotherapy Service. Heather qualified as a Hippotherapist in 2013. She has always loved horses and started riding age 7! Because of the generosity, support and enthusiasm of MRT, one of the most effective forms of physiotherapy I have experienced is now available through the NHS. It is great fun both for me and for the children I work with, doesn’t feel like therapy, and it delivers consistently amazing results. It is also much easier to connect with a child and for them to trust me using the ponies as an intermediary. It is a 3-way therapeutic relationship, or 4-way if you count the Volunteer key workers too! I am hugely grateful to MRT. The ponies and volunteers are brilliant. The ponies are exceptionally well trained and cared for, and the volunteers are highly professional. The level of training of both ponies and volunteers is outstanding. The enthusiasm of everyone makes MRT a lovely place to work and learn. Racing Kishmul [now-retired MRT Therapy Pony who was awarded a Long Service Award by HRH Princess Anne] at Musselburgh Racecourse, for one of the charity’s fundraisers! Finally becoming a fully qualified hippotherapist in 2013 after 14 years of study. I never would have qualified without MRT, we learned together! Starting the Summer Intensive Hippotherapy sessions (6 sessions over 2 weeks) and realising how effective intensive hippotherapy can be. Our Therapeutic Riding Partnership Being Highly Commended as one of the 4 most effective and innovative projects out of hundreds of entries at the 2014 NHS Scotland Event. Being invited to speak about our Therapeutic Riding Partnership to Scottish physiotherapy managers at the Chartered Society of Physiotherapy conference, paediatric physiotherapists at the Association of Chartered Physiotherapists in Paediatrics (APCP) conference, British Hippotherapists at the Association of Chartered Physiotherapists in Therapeutic Riding (ACPTR)conference, and Physiotherapy students at the Scottish Student Physiotherapy conference (alongside a physio from Hedley Court and one from NASA!) all within 12 months. My colleague Lizzie being supported by NHS Lothian to train as a hippotherapist and join the team. Sessions have been extended which means we are now able to treat up to 10 children each week and have capacity to provide blocks of hippotherapy to approximately 50 children a year. But my best highlight is always all the lovely children and families we get to work with. Nothing can make you smile like a child delighted by a pony!